ABOVE: Campers at Blatherskite Park before the grounds were closed to them under pressure from private caravan park owners. 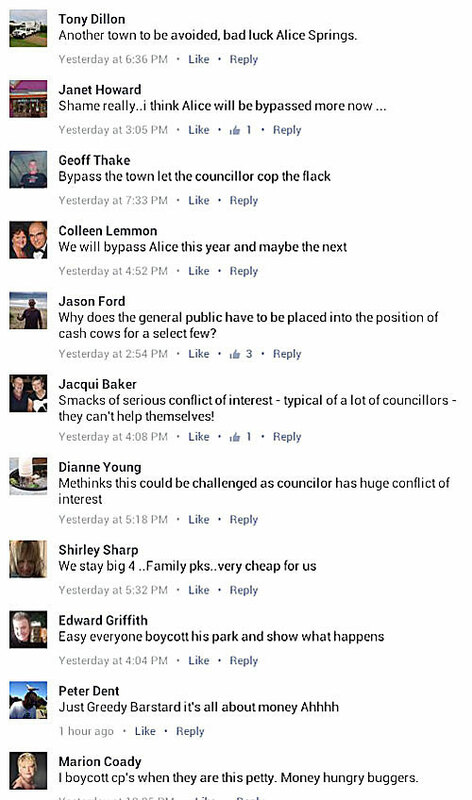 BOTTOM OF REPORT: Part of an avalanche of Facebook comments hostile to Alice Springs. As the annual grey nomads migration north is getting under way, Alice Springs is copping a hammering from motorhome and caravan travellers over the closing of low-cost overnighting facilities at Blatherskite Park, also known as the show grounds. Dozens of Facebook posts are saying travellers ought to avoid staying in the town and buy only a minimum of provisions from local businesses. Town Council member Brendan Heenan comes under attack in allegations that as the owner of the MacDonnell Range caravan park he had a vested interest in the closure. Cr Heenan was a vocal opponent of the grounds being used as a caravan park, but the Town Council does not own nor control Blatherskite Park: It is owned by the NT Government and managed by a trust run by volunteers. Mr Heenan says Blatherskite Park does not pay rates and “undercutting all the commercial properties”. He says the operation was closed after representation by the caravan park owners’ association to the government. The show grounds can still be used for “overflow” of visitors when all the other parks are full. This will be managed by Tourism Central Australia which will charge similar rates to the commercial parks. Mr Heenan also says camping of participants in large events, such as the Ulysses bikers’ club national convention, will still be permitted. He says about the RV group: “They want something for nothing.” He says the industry, a major employer in the town, would collapse. There would also be major problems of handling waste an the chemicals used in RV onboard toilets. The trust, which ran the camping operation as a fundraiser, has recently stated that the closure is putting it into serious financial difficulties. 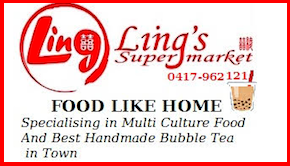 A string of community and sporting clubs uses the grounds, and the hugely popular annual show is held there. The point made by Cr Heenan and other councillors was that a facility with access to government funds ought not to be in competition with private enterprise. The NT is clearly behind the eightball in the lucrative drive market: The Campervan & Motorhome Club of Australia, which has more than 66,000 members according to its website, promotes “RV friendly towns”: 58 in NSW, 54 in Queensland, 41 in SA, 41 in Victoria, 46 in Tasmania and 46 in WA. There is not a single one in the Northern Territory. 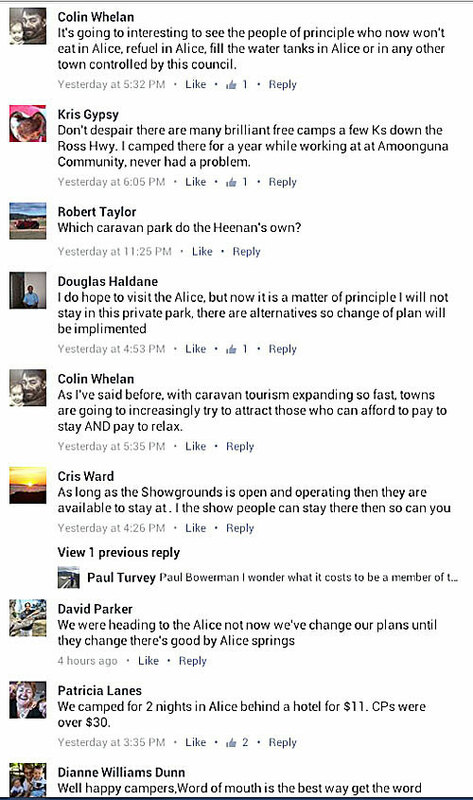 This is what the website Free Choice Camping – 13,442 Facebook likes – said on Saturday: “Well, it’s finally happened: The Alice Springs show ground is closed to camping. “Some time ago we ran this story (which we will run again) and now we hear that the axe has finally fallen on the poor old show ground according to reports on the Caravanners Forum which no doubts need the income to support this community facility. “The real pity is the owner of the park kicking up most of the stink is a local councillor. 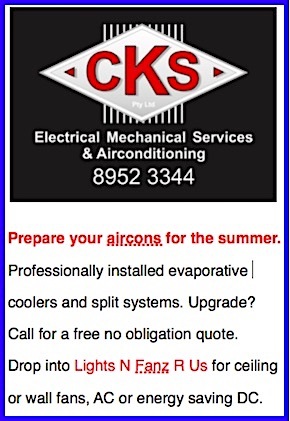 “To quote in part from the CV listed on the council web site: ‘Councillor Heenan and his wife Bev are the owners of a successful caravan park’ and ‘Councillor Heenan’s community involvement includes roles as President of the NT Caravan Park Association, CRVA National Board member and as a Bindi board member’. “It was only recently we read an article about the family entering the tourism business and starting from nothing and building a highly successful business,” continues the Free Choice Camping Facebook page. Camping at Blatherskite park cost about half as much as Cr Heenan’s park charges, which is of exceptionally high standard and has won a string of Brolgas. • I think Alice will be bypassed more now. • Why does the general public have to be placed into the position of cash cows for a selected few? • Easy. Everybody boycott his park and show what happens. 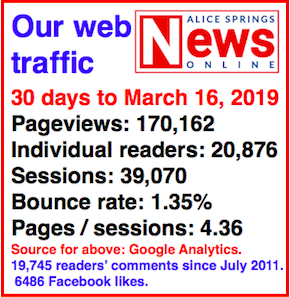 The Alice Springs News Online is seeking comment from the Blatherskite Park Trustees, Tourism Central Australia and Tourism NT. Stephen Schwer, CEO, Tourism Central Australia, said today: “The team at the Alice Springs Visitor Information Centre are as always happy to help travellers with accommodation requests. They can recommend accommodation to suit all tastes and budgets. “Blatherskite Park is currently not compliant for camping, however I am working with the board of the park to work out how the site can become compliant. Overflow parking is just that – overflow! 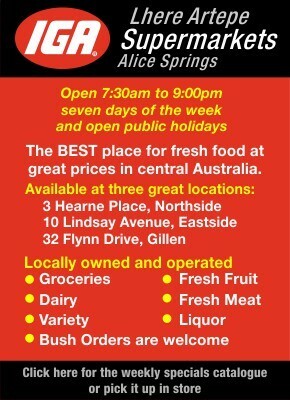 If you want to be so narrow minded that you want to boycott Alice Springs because it is Show Time and there are a LOT of people who need to be in this space, then perhaps you should take your FREE camping out into an area without any conveniences at all and learn to live without shops etc. Quit being such cheapskates and put something into these precious areas of our country. I have read all of this with interest. I would like to correct some incorrect information in this article. The second line of the seventh paragraph states “This will be managed by Tourism Central Australia which will charge similar rates to the commercial parks”. As the CEO of Tourism Central Australia, I can confirm that we do not make bookings on the behalf of Blatherskite Park, nor do we set their prices. A quick phone call to me would have cleared this up. Blatherskite Park is currently uncompliant, however steps are being taken to make the park compliant. Once this is the case, it will hopefully reopen. Until then, please avoid hysteria. It seems it needs to be horses for courses. Some people want extensive facilities and some want basic. Councils and communities all over Australia own and operate caravan and camping facilities. 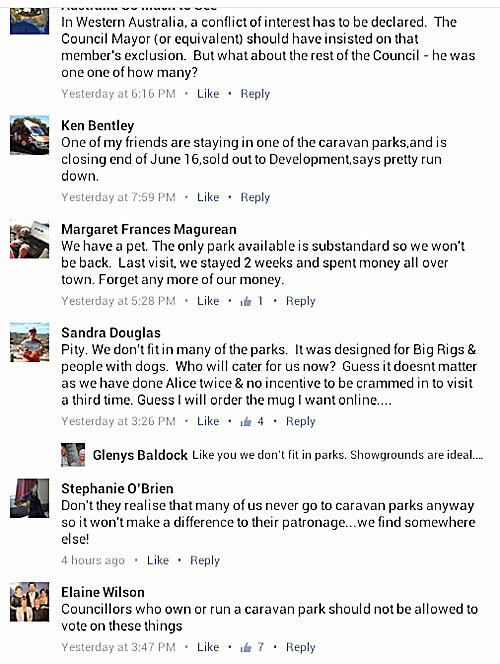 So if Blatherskite Park is not OK maybe council could own and operate a camping and caravan facility at another venue. And I will for the moment ignore vested interests on Alice Springs Town Council. The great pity of this is apparently, it is going to be easier in the future for travellers from the south to get to the Alice. Why? Because last night’s Federal Budget announced $12 million to build a highway overpass over the railway line just south of the Alice. Some media commentators this morning were reviving Amanda Vanstone’s line about a “sanger and a milkshake” Budget. I prefer to think of Mr Morrison’s offerings as a Vegemite smoothie – the more of it you try to digest, the more unpalatable it becomes. Perhaps Nigel can explain about the overpass. I thought he and the Chief Monster did a trip down there a few months ago on Adam 1 to open something that sounds remarkably similar. 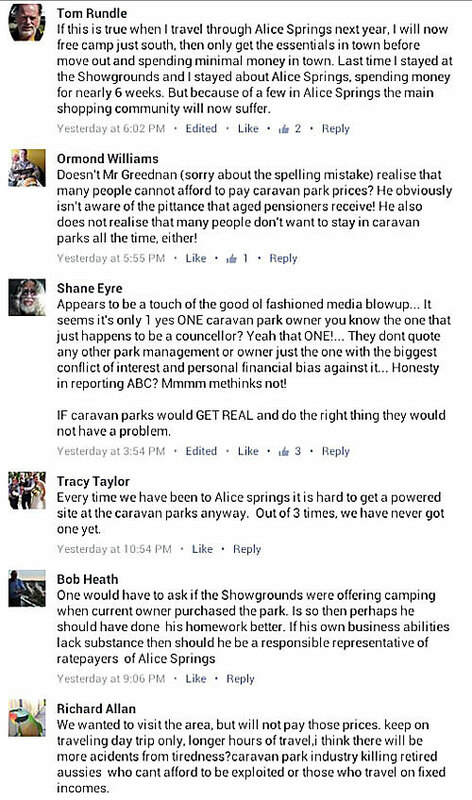 We have to remember that the caravan park owners have to be able to support their businesses. Prices aren’t plucked from thin air, they’re determined so as to be able to offer the camper the best price whilst still making the owner some money. Take a look at the facilities most caravan parks offer, how do you think they can afford to offer campers these facilities? Toilets, laundries, camp kitchens, pools, playgrounds, landscaping, staff and the list goes on. And don’t forget that most parks are seasonal, they only make money for four or five months a year. Don’t kick the poor park owner for trying to make a living. That’s all most are doing. I think if you can afford to go on holidays, then paying for caravan parks should not be an issue. The alternative is to stay home. Why should everyone always expect a free ride, so to speak. The man is trying to earn a living. 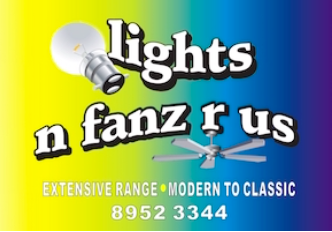 How do his prices compare to other caravan parks in Australia? Remember, apples for apples. The Big 4 in Alice is one of the best in Australia. In my opinion there should not have been any camping at the show grounds to begin with. It’s unfortunate that the debate around public and private investment somehow assumes they should be mutually exclusive. Quite the opposite is the truth, in a successful society. We have many examples around us, in education, health, infrastructure, transport, tourism and so on. Business models no longer observe distinctions between public, private and charity / not-for-profit: an unhelpful simplification that hinders innovation and gets in the way of meeting needs. I, for one, am very happy to see public / community assets managed in such a way that maximises their access and use – not for the benefit of the few, but for the many. The type and range of accommodation available to travelers should be diverse and cater for everyone – not everyone wants simple or rustic, but not everyone wants all the trappings, either. The flawed assumptions and compromising interests in this story should raise alarm, about the tenor of public debate, and the nature of accountability, as they impact on all of us. Let’s think about what’s best for the most and start from there. But Chris, I don’t like paying for things I don’t want. I stay in caravan parks about one in three nights. I prefer showgrounds and the like. The maximum I will pay for a CP is $35 per night, as anything over that I regard as excessive. $39 for unpowered site is way over the top. Blatherskite Park was meeting a need, and by meeting that need, the income was being put back into the park, not into someone’s pocket. I live here and we have brought a 26 foot caravan and I wonder how many caravan parks can cater for our van and the F250 we pull it with here in Alice. We travelled last Christmas from Victoria to Qld back to Alice and if it wasn’t for showgrounds and rare caravan parks and good friends to cater for our size we had to free camp. I personally enjoyed the showgrounds when we were not at a mate’s place. There are many caravan parks in Alice, even four within walking distance to Blatherskite park. All with much better facilities like laundromats, swimming pools and camp kitchens. They have all been affected by the undercutting of Blatherskite and one at Heavitree Gap is even closing. 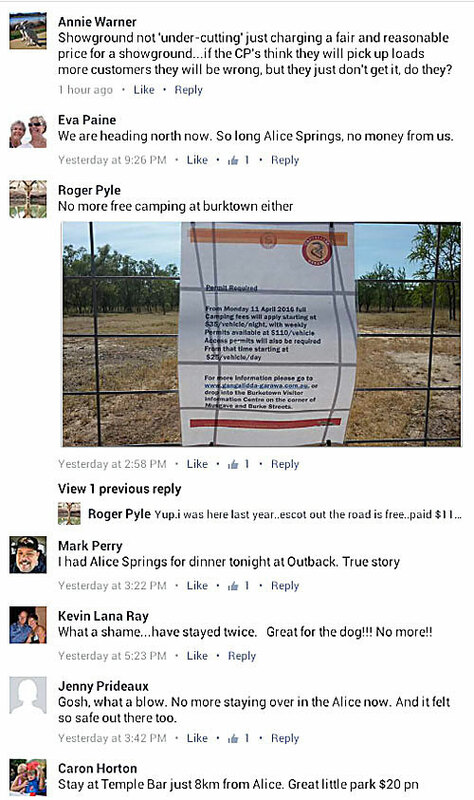 There is plenty of free camping all the way to Alice but surely most people will want a park to stay at with facilities, security and catch up with the laundry, rubbish removal and the like. @ Morgan: Big4, $39 per night unpowered. I stopped there last time, but never again. Grey Nomads still have to eat, drink, fill their vehicles with fuel, pay to enter tourist attractions, etc. The longer you can keep them there, the more the town prospers. Expensive caravan parks are not the answer. Freedom of choice is the answer. $298 a night at the river? Please explain! What we need is a clear policy statement by the CLP about its funding support for Blatherskite Park into the future. It is understandable that the CLP would support prominent local member Brendan Heenan’s wishes as he always supports the CLP agenda regarding council matters. However it is worth recognising that Blatherskite Park has to run like a business also. They pay the same insurance, taxes and many other on-costs too! We had three lots of friends traveling together in caravans. They arrived late Sunday afternoon went straight to Coles. One of the Ladies was nearly assaulted. They said people were peeing on the walls and the language was so bad. So nine people who were going to stay a week left the next day. They said they didn’t feel safe. So that a lot of money Alice missed out on – and how many time does this happen? Many many times and Council and the Chief Minister said every thing is good. I think someone has their head in the sand! Local businesses, don’t let the caravan park lobby turn away your customers. Fight back, stand up for yourselves. Get your share of the tourism dollar. I sympathise with Cr Heenan. He is trying to run a business and is required to pay Workers Comp, rates, payroll tax etc, while the show ground as a NFP is able to operate cheaply and undercut a business. We also pay for the dump site, for their grey/black water, which if they stay in parks the park owner pays to P&W. Businesses are an enterprise, while a NFP has a social purpose. We also need to consider if the show ground is going to go broke and needs propping up by taxpayers / ratepayers in the future. The overall tourist market needs looking at, but if these grey nomads are saying how they can’t afford to pay more than $15 a night, maybe they aren’t very lucrative tourists anyway. They probably are visiting national park sites for free, and doing all their shopping at Coles. I would also love to be able to drive to Yulara without coming across camper vans doing 80km/hr. Why do tourists get a discount for sleeping at the show ground when locals pay $298 a night at the river with no facilities? Unlike backpackers they don’t drink in local bars, or take Rock Tours.